A AmnioGraft is CryoTek® cryopreserved processed amniotic membrane and is used as either a biologic ocular bandage to assist healing or as an ocular transplantation graft to repair or replace damaged tissue. As a surgical graft, AmnioGraft repopulates with host cells from the surrounding tissue. As a biologic bandage, AmnioGraft acts as a physical barrier against the external environment, and can deliver anti-scarring, anti-inflammatory, and anti-angiogenic biologics to the ocular surface. It also supports epithelial adhesion and differentiation, and has anti-adhesive properties to minimize scarring. Q Which CPT codes are used for amniotic membrane transplantation? A third code, 65426 (Excision or transposition of pterygium; with graft), may also apply to surgery using AmnioGraft, but the tissue graft is not separately identified or billed since it is the graft. Note: The code for pterygium doesn’t change if tissue glue is used since 65426 doesn’t specify how the graft is attached. Q Does Medicare cover procedures using amniotic membrane tissue? Q What are the indications for AmnioGraft? A The use of amniotic tissue for assistance with wound healing has been advocated for over 65 years. Amniotic membrane tissue is indicated for the management of ocular wounds. The allograft maintains a moist environment which helps provide a physiologically favorable milieu for ocular wound management such as in the reduction of inflammation and scarring, and in reducing abnormal blood vessel growth. Amniotic membrane transplantation has proven beneficial where frequent topical lubrication has failed and as an alternative to tarsorrhaphy, punctal occlusion, tissue adhesives, and conjunctival flaps. The following list shows the most common indications. Q What are Medicare’s allowed amounts for these procedures? Q Are there any other restrictions on Medicare reimbursement? A Yes. Medicare’s National Correct Coding Initiative (NCCI) edits bundle amniotic membrane tissue transplantation procedures (65779, 65780) with pterygium removal (65420, 65426), and with the keratoplasty codes (65710, 65730, 65750, 65755, 65756). NCCI edits change quarterly; so check them periodically. Other third party payers are not obliged to follow Medicare’s NCCI edits, although many do. Check with the payers. Q Does Medicare pay for the supply of AmnioGraft separately? A No, the supply is included in the provider reimbursement. HCPCS code V2790, amniotic membrane for surgical reconstruction per procedure, is no longer eligible for discrete Medi-care payment in any setting. The large discrepancy between the physician’s reimbursement for 65779 in office vs. in a facility addresses this – the supply is part of the physician’s allowance when the procedure is done in the office, or part of the facility fee. Note that there is no difference in the surgeon’s allowable for 65780; this procedure is assumed by Medicare always to be performed in a facility. As with all payment rates, other payers may have different policies regarding the supply of Amnio-Graft. Check with your payers. 1 These amounts are adjusted in each area by local indices. Other payers set their own fee schedules, which may differ considerably from Medicare rates. 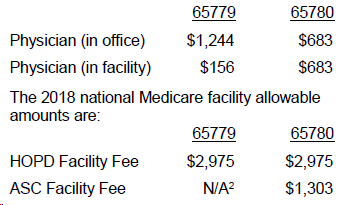 2 The 2017 Medicare ASC fee schedule does not include a value for 65779.